12" tall, plastic blowmold Christmas light. Features Santa Claus coming down a chimney. Newer light cord, with on/off switch attached. Acrylic case has a crack in lower left side corner as pictured. Still a nice item to display. dr who dapol dalek cyberman ice warrior the fourth doctor lot Condition is New. Shipped with USPS Priority Mail. The Tardis light works. It's never been played with only on display in the box. Also, I noticed that the Daleks head doesn't move. 1988 Dapol Doctor Who K-9 20th Anniversary Figure Rainbow Card READ FREE SHIP ! Still a nice item to display or open. Doctor Who Dapol 25th Anniversary Set Complete. Condition is Used. Shipped with USPS Priority Mail. plastic is separating from cardboard, item comes as shown in photos. Dapol Action Fiigure 1987 NEW IN BOX (rare). The Doctor. Doctor Who Dapol Bump and Go Marx Dalek. The one pictured is the one you will receive This one was opened for pictures only! Red in color! Also available in Silver! BNIP Doctor Who Melkur action figure by Dapol. Brand new! In original packaging!!! Second Doctor. Made by Dapol. Mint on card. a pretty image. Weight: 8 oz. DOCTOR WHO BLACK AND GOLD DALEK. Card is slightly Wavy from storage, but bubble is securely attached to card. Vintage DAPOL INDUSTRIES Plastic Tabletop Blow Mold Santa U.S.A. 1960's V.G.C. 1987 Dapol Doctor Who action figure Mel blue shirt variant SEALED vintage MOC. Condition is New. Package has tear and pin hole around peg hole, see pics. Shipped with USPS First Class Package. VERY hard to find item! 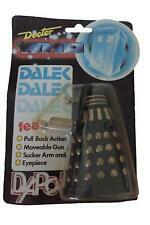 Blue Dalek was only available in this set. VERY hard to find item! I only have this one set!